This is the 400th animal that I have written about on this blog, so I am writing about the scimitar-horned oryx. 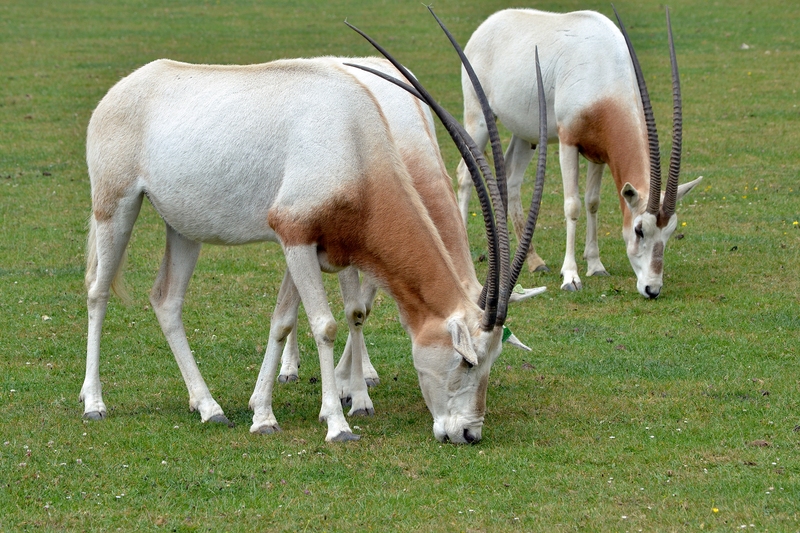 Scimitar-horned oryx are magnificent animals that grow over a metre tall and 1.7 metres long. Males are much larger than females. They get their names from their elegant horns that curve backwards like a scimitar sword and can grow over 1 metre long. Both the males and females have horns. Scimitar-horned oryx are able to go without drinking for 9-10 months which is helpful when living in the desert. They live in herds of up to 40 animals, led by a dominant male. They are mostly active during the early morning and late evening, spending the day in the shade of trees or in holes that they dig in the ground to keep cool. Scimitar-horned oryx used to be quite common throughout northern Africa, but they were hunted for their horns and for meat until they became extinct in the wild. Thankfully, there were some kept in captivity and now they have been bred in zoos around the world. A program has been conducted to reintroduce them into the wild, so hopefully soon they will be seen in the wild again where they belong. Are there any other interesting facts that you would like to share about scimitar-horned oryx? How does one know how old a male is? Can you gauge by horn girth or length?